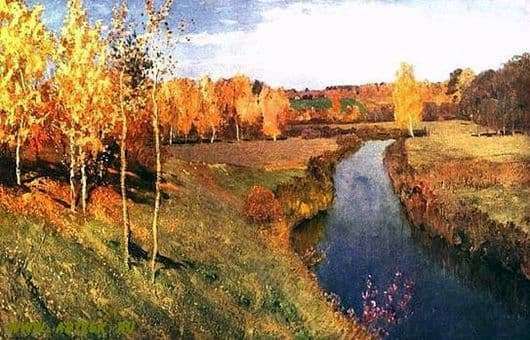 In the Tretyakov Gallery there are two paintings by Levitan “Golden Autumn” – the 95th and 96th years. The artist lived these years near the ancient village of Ostrovno (mentioned even in the annals of the period of the end of the Horde yoke) under Vyshny Volochok, in the Tver region (two more ancient cities). The usual theme of the artist’s autumn landscapes (he has about a hundred “autumn” paintings!) Is “sad nature fading.” But in this picture there is no sadness at all! – Beautiful Russian forest river of deep blue color, as it happens in the autumn under the bright sun, brilliant crowns of wished trees with reflected gold of light. The sun itself is not visible, but its rays joyfully play with their glare all over the canvas, as in the river, and in cirrus clouds in a serene blue sky. With this game of festive colors, the “brown with okhryan” contrasts a little, the color of the steep shore in the foreground, apparently darkened by the straw roof of the barn soaked from past rains. But the light-golden crowns of the trees, behind which the river disappears, complementing the general range, affirm us in a light, joyful mood. Nature on the canvas does not “fade”, she is happy about autumn, her golden brocade outfits. And the three main, dominant colors of this picture – golden, blue, blue with the addition of a touch of green – these are all the colors of joy, the colors of the fullness of life.